It's been just over two years. I drew this octopus to celebrate, because the second anniversary is the cephalopod anniversary. 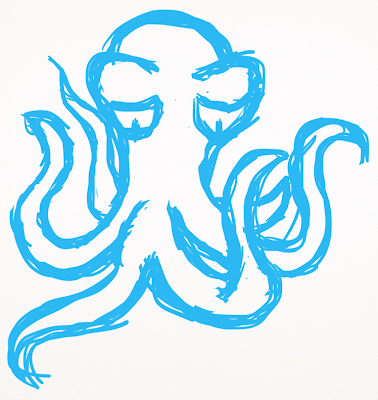 Honestly, I drew the octopus, and then later realised that it was my blog's cephalopod anniversary, AND both of these things happened two weeks after the the actual anniversary. The day just kind of came and went. I didn't write it down at the time. Google did that for me. It happened automatically. They built it into the site. It's very technical. It probably isn't that technical, but let's leave it where it is. It's strange to think that some things have changed, some things haven't, and some things changed and then unchanged. Actually, not that strange at all really. Pretty straight forward as far as life is concerned. I'm not really saying anything of merit here in this paragraph. You could skip ahead, but I don't know where you would come back in. I haven't written that bit yet, and it's unlikely that I will come back and mend this once I have. You might just have to stick with me for a moment. What is weird is that I was convinced that I would end up writing less and less, and eventually get to a point where I posted once every few months, which very immediately looked like that was what was going on. United by Glue was, in my mind, the kind of place that my words would come to die. I wasn't expecting to get to a point where I was writing as much as I have ended up writing for this thing. It waxes and wanes, but it doesn't ever really drop off to nil. That is weird to me. That was the fate of the original United by Glue. There was another one, years ago. I never had the url before, but there was a United by Glue that was kind of a blog, but also kind of a deliberate navigation nightmare. There was this whole thing about forcing the user to explore the site to find things, and it would get more and more advanced the deeper you got. I found the html files recently. Some of the other original files are missing. Part of me is interested in re-exploring that idea with the things I have learned since then, but that is a fairly epic project. The kind I couldn't really find the time for these days. I t was going to be my major work for my final year of art school, which I never completed. It's a different scene now. The internet is less abrasive as an entity. It has definitely mellowed. The tools and the rules have changed, and it seems to be far more about opinion info dumping these days. Selling things, and counting visits and visitors. I like the idea that people are reading my opinio-dumps, and they do, but in the end I'd be here anyway. I enjoy the sound of tapping, and the nearly total lack of accomplishment while doing so. Somewhere along the way Twitter entered the scene, which is kind of a non-event for me. It works a bit. It would work better; I'm using it wrong, which is something I should change. I probably not going to do that, realistically speaking. I kind of like the way I use it. Occasionally I think of a thing that could be expressed as words, and when I think of it I send those words out to people's devices via the tubes. Everything is just kind of bits and pieces right now. I want to try some other things, but they take time to plan and set up. I'll see what I can do. I hope you enjoy the octopus. It might be the Octo-Hoff; I haven't decided.